All attendees entering Gampel throughout the day will need to go through a metal detector each time they enter. Please allow plenty of time to get through the line! Don't worry, Gampel security is aware that invention prototypes may contain metal. Concession stands will be open in Gampel. Please feel free to pack a picnic to eat outside**. For other dining options on campus, Click Here. **Note: CIC is not yet certain outside food will be allowed inside Gampel. If you bring your lunch you may have to leave it in a cooler in your car. More to come, as soon as we know. 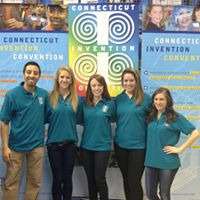 Inventors will be in three locations on campus: Gampel Pavilion, Rome Commons Ballroom and the Student Union. Building and circle assignments will be posted by May 1st at www.ctinventionconvention.org. You must report to your assigned circle or you will not be judged. There is no changing circles. Your Invention Log and Poster Board. Your Photo Release/Permission Form -- Click Here for a copy. Picnic lunch or money to purchase food at concessions or dining halls. Prototype Reminders: No electricity is provided for prototypes. Inventors should plan to describe how the invention works or can use video or pictures to use in their explanation. Prototype must fit in the space in front of the display board on the table or the floor, no larger than 2' wide x 2' deep (height is less of an issue, but the inventor should be able to carry their own prototype.) Over-sized prototypes are not permitted in the venue. For large inventions, the inventor should record a short video of the invention and use their own device to show the video at events. The fee for the CIC State Finals Event is $45 per student, payable by the parents by credit card, or by the school by credit card or check. It is not too late to sign up to be a judge! A light breakfast is included followed by lunch and a keepsake gift from us after judging concludes. 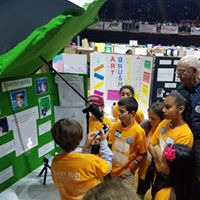 If you are interested in STEAM, teaching, engineering, entrepreneurship, inventing and amazing kids, then we need you as a CIC judge! To see the Judge's Typical Schedule of the Day, Click Here. Check-in and Training for NEW JUDGES (if you have judged three years or less) will be at 7:30 am at McHugh Hall on May 4th. If you are an EXPERIENCED JUDGE (have judged more than 3 years), check-in is at 8:15 am at McHugh Hall. Teachers are welcome and encouraged to attend Finals to support their students. Please let us know if you are willing to be official floor monitor during Judging Circles by checking in at the Brick Room at Gampel Pavilion prior to 9:30 am to get a T-Shirt and an official ID and lanyard. After judging concludes, please join us for a free Teacher Appreciation Luncheon and program "Your Students CAN Do This!" Pre-registration is required for the luncheon: Click Here. Payment Deadline for Student Registration Fee is April 20th. ​Volunteers are needed for every aspect of the day and for setup. 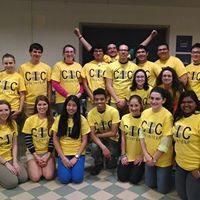 Shift are three hours and include food and a CIC T-shirt! This is a great opportunity for high school students, corporate teams, parents of inventors, judge spouses, or anyone interested in serving a vibrant community event. Please register here and our volunteer coordinator, Karen Green will contact you with more details. More details will be emailed weekly so stay tuned.